Tauranga City Council’s controversial Pilot Bay boardwalk is a step closer after hundreds of residents turned out for the public consultation yesterday afternoon. Held at Pilot Bay, from 3.30-6.30pm, about 200 people attended council’s public information session showing the proposed final design for the $500,000 walkway along the Bay’s waterfront. Councillors and public meet to discuss the proposed Pilot Bay boardwalk. The proposed boardwalk along Pilot Bay. Everyone who attended the information session was encouraged to write down their feedback, which will be collated and presented to elected council members later this morning. Tauranga City Council park rangers team leader Warren Aitken says he is extremely happy with the turnout and is pleased to see people with a number of opinions. “It’s a good chance for us to put forward the design and show that there is still some flexibility in the final design. He says there is some flexibility in the width in parts of the boardwalk because of the differences in the undulation of the ground. Last year, council received 145 submissions on the boardwalk with 83 per cent in support of making improvements to the space through constructing a path or enhancing the turf, while 77 per cent of those in support preferred a hard surface. 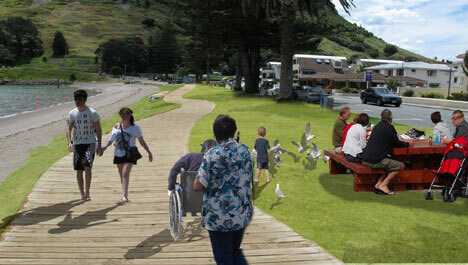 The boardwalk will be constructed using timber from the Rena and has two proposed widths – 2.5metres and 3metres. Councillor Tony Christiansen says while the proposal is not yet finalised the opportunity is there to take the boardwalk all the way around to the Mount. He says a 2.5metre width is more than adequate, but admits this is a stepped approach with nothing set in stone. Wheelchair user Bryce McFall says the proposed plan is very good and believes it will be an asset for all residents. He says a mix of the two widths is needed as some areas along the beach need to be wider to accommodate prams and wheelchair users. Concrete intersections will be constructed allowing access to pedestrian crossings. Mount Maunganui resident Amy Scott says after coming along to view the proposed plans she still believes it will be a good thing for the area. “I am definitely for it. I’m wishing the boardwalk would continue right around to Tay Street. She says being able to come along and have a look at what the council is proposing is really beneficial for everyone involved. Mount resident Leigh Pettigrew opposes a full length boardwalk saying he has seen the proposal a thousand times and his viewpoint has not swayed. He believes it should instead be constructed as a walkway through the mid-section of the beach where maintenance of the grass has been neglected by council. “Grass is cheap and it’s easy to maintain. We probably would not have a boardwalk if they [council] had maintained the grass,” says Leigh. “I’ve got no doubt in my mind that it should be used as a relaxation area for families. Construction for the boardwalk is expected to begin next month, following the collation of public feedback, and to be completed by July. Councillor Tony Christiansen and Bryce McFall compare the two widths of the proposed boardwalk.